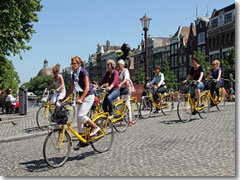 There are three kinds of escorted tours in Amsterdam: Walking tours, biking tours, and canal boat tours. Canal cruises are covered on a seperate page. You can get two–three hour bike tours for around $26–$30 with Viator.com, UrbanAdventures.com, Mikesbiketoursamsterdam.com, or Yellowbike.nl.